Parker and Zeus, Sue Meinzinger's two German Shepherds know how to pull a Sacco cart very fast. They race fall and winter with the Northwest Sled Dog Association. When Sue hitched her shepherds to my Jones Dog Scooter one Sunday afternoon in April, these experienced dogs knew what to do. They took off at a lope down the trail pulling Sue on the scooter easily and fast. If your dogs, like Sue's, know what to do with sleds and carts, it is easy to switch to a scooter. A scooter opens up new possibilities. In Sue's case she now can follow narrow paths through the woods where the Sacco cart could not go. She can exercise along with the dogs by scooting to keep up speed. She can put the scooter in the back of the car along with the dog and be more spur of the moment with her outings. It was a beautiful Sunday afternoon. We passed children learning to ride two wheel bikes and older siblings practicing their roller blades and skateboards. (Dog knows the command "Pass Haw" which means veer to the left to pass on the left side of the people in front of us.) Rubro was panting but did not seem too hot. I told him we were going to the Dog Park and soon he could swim. We passed the hill where people fly kites and then the sculptures of orca fins rising from the turf. Finally we arrived at the gate to the dog park. I opened the gate and to the water we scooted. I took off Rubro's harness and took the dummy from my bag. I threw it far into the water. Many retrieves later Rubro is back in harness and we are ready to circle back to the car through the furthest gate of the Dog Park. As we proceed on the cindered trail, Rubro passes many dogs walking and playing and catching Frisbees off leash. (Skill: Dog knows that when he is in harness he does not stop to play. He keeps on going in a straight line.) Most of the dogs ignore him. Several times a dog comes to investigate and gets between Rubro and the scooter. This causes no problem because Rubro ignores their advances and just keeps trotting and I steer the scooter around the dogs. No dog wants to pick a fight; they are just curious or want to play. Rubro always keeps on the right side of the trail. After we leave the dog park, I tell Rubro "Go to the car". We take short cut across a 200 yard rough field. I like to scooter off pavement when I can. (Skill: Dog will strike a straight line across an open space even when there is no trail.) Once back on the entrance road to the Park, we retrace our steps to the traffic light, up the hill and back onto the bicycle trail. Half a mile down the Burke Gilman Trail, Rubro finds the little path that threads back to the street end where we had parked. (Skill: retracing steps/going back to the car/saving owner from being lost.) In the car Rubro is not panting at all. He is not overheated. The end of a long convalescence from a dislocated right elbow is in sight. My Rottweiler, Rubromarginata, and Sue Meinzinger's German Shepherds, Parker and Zeus, have different skills. I had the opportunity to scooter with Sue's super athletic Zeus. When I rode a scooter with Zeus pulling, he ran to catch Sue. Zeus ran so fast my baseball cap blew off my head! Sue's dogs are fast, strong, and athletic. Rubro is reliable, easy going, and friendly with both dogs and people. The ideal scooter dog would have Zeus' speed and Rubro's biddability and relaxed attitude toward strange dogs and people. How do you train a dog to pull a scooter? There are many ways. I heard of this method from Andrew Pinner in Australia. 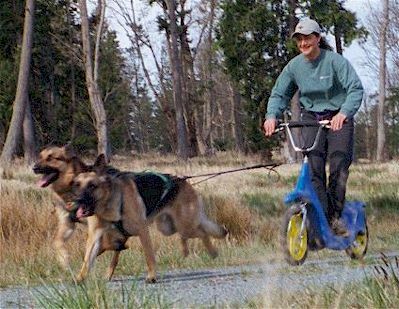 He harnessed his German Shepherd to his scooter and had his wife ride her bike in front of him. The shepherd chased after the wife. In two outings the shepherd knew how to pull a scooter. I used to walk Rubro around an urban lake called Green Lake. It took an hour and it was how I got my exercise. Rubro was very familiar with this no-brainer trail. One day I put on roller blades and a harness on Rubro. He was scared to go in front of me because he was trained to walk quietly beside me. I kept waiving him on and whenever he went in front instead of beside me, I told him, "Good dog". Soon Rubro ran in front of me. A few more outings around the Lake and Rubro knew how to run in front of me and pull. He learned that when the leash is on the harness he is to pull and when the leash is on the collar he is to walk by my side without pulling. An unforeseen advantage of training at Green Lake was that due to heavy pedestrian use, wheeled traffic can only go counter clockwise around the lake and can only stay on the right side of the trail. Rubro learned to stay to the right on sidewalks and trails. A friend hitched her two dogs to one of my scooters on a Saturday afternoon. They followed Rubro and me and our scooter down a path in a wooded park. When the two dogs stopped to smell the bushes, my friend said "No. On by!." By the end of the short trip they were getting the idea that you run in harness. You smell the bushes when on a casual walk with leash on collar. 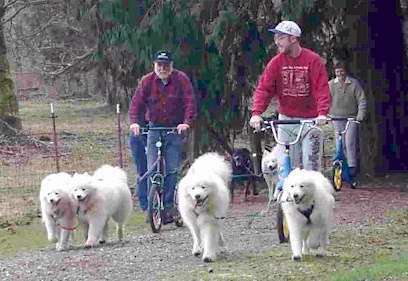 Mushers train by allowing the pups to run along freely beside the adult dogs when they are pulling carts on training runs. When the pups are old enough, they are put in harness with a small team and taken on very short runs, say half a mile. The mushers make sure that the runs are fun for the pups. The runs are not too fast and not too long. The pup should be wanting more when the run is over. My book, "My Dog Likes to Run. I Like to Ride", other training books and magazines describe how to train a dog in greater detail than I can here. Practice mushing commands whenever you are walking on a leash. If you are about to turn right. Announce it. "Fido! Gee!" then pivot right. Are you coming to a traffic light? Say, "Wait" and stop. Put the harness on the dog. Attach a log or 2 x 4 or small tire. Go for walks with the dog pulling the "drag". Lots of "good dog!" For initial runs go to a safe familiar trail with no auto traffic. Dogs naturally want to go! Having worked recently with novice dogs, I think the most important new command would be "Stand". "Stand" means "stay in place; don't turn in circles and tangle the lines and harness!" "Stay" will do the same job if the dog understands that "Stay" means don't move your feet. Rubro knows that when he is in harness and comes to a stop he stands. He never turns and tangles the harness. I do not need to use the command "Stand" except as a reminder at dangerous intersections when we are, say, waiting for a traffic light to change. P.S. Today Rubro and I went on a trail beside the Cedar River in Renton, Washington. Squirrels ran in front of us. Rubro speeded to a lope and remained on the path even though the squirrel did not. So he has loped four times not three. There is hope for speed on command.